Q. What could motivate Nebraska young people to write letters? A. A great story—and the opportunity to tell an author about how a book made a difference in their own life. Last year teachers and librarians across Nebraska were recently awarded grants to host pilot Letter Writing Clinics for students in their area. The clinics introduced students to the Letters About Literature contest and letter writing techniques. Students got ideas for selecting books and learned how to craft letters that can be submitted to the Letters About Literature contest, a national reading and writing promotion program (from the library of Congress) that anually engages nearly 50,000 adolescent and young readers in grades four through twelve. 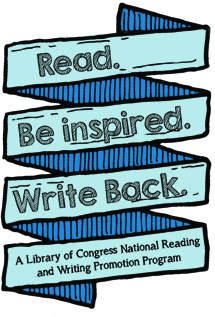 The competition encourages young people to read, be inspired, and write back to the author (living or dead) who had an impact on their lives. a) Choose a target audience and select promotional activities and resources to match the audience. b) Plan activities for the Letter Writing Clinic (the clinic can involve two sessions--one to introduce the idea and to help the students to select books and another to learn letter writing techniques and to craft the letters. c) Following the clinic(s), completed letters should be collected and submitted to the contest when it officially opens in September. Keep up with Letter Writing Clinic activities on social media at https://www.facebook.com/NebraskaCenterfortheBook. Deadlines: The Letter Writing Clinic deadline was April 15, 2018. The Contest deadline for all Levels to submit letters is December 14, 2018. The Contest deadline for all Levels to submit letters will be December 14, 2018.
Letters About Literature Contest: To learn more about the Letters About Literature Contest, refer to the Letters About Literature web page on The Nebraska Center for the Book’s website. Deadline for letters: December 2018. The grant deadline for 2018 is past. Purpose of Grant: Grants will support Letters About Literature (LAL) Letter Writing Clinics (held in Nebraska) to introduce students to the Letters About Literature contest and letter writing techniques.The Letter Writing Clinic/Letters About Literature competition should NOT be a required school assignment and Clinics should be offered at no charge to interested students. Grant Amount: Five $300 grants will be awarded in April 2018. The grant funds can be used for items such as instructor honorarium, supplies, marketing, small participation prizes, etc. Eligible Grant Applicants: Eligible Nebraska applicants include the following: public libraries, public and private schools (Elementary, Middle, Jr. High, High Schools), public librarians, public and private school librarians, and public and private school teachers (grades 4–12). Partnerships between teachers and librarians are encouraged. RE: time and location details about the Letter Writing Clinic at least two weeks prior to the event. Report on how many students were served, how many letters were submitted to the contest, and the primary trainer for the clinic(s). Photographs taken during the clinic along with signed Photo Releases, along with samples of promotional and learning materials, are appreciated. This grant opportunity is made possible by funding provided to the Nebraska Center for the Book by Humanities Nebraska and the Nebraska Cultural Endowment, with support from the Nebraska Library Commission. Mary Jo Ryan, Nebraska Library Commission at 402-471-3434, 800-307-2665.